…was biking and I finally went on a different trail today! 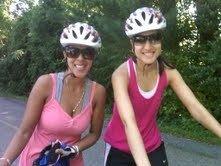 I met up with Shima and we rode 7 miles from Bethesda, MD to Georgetown, DC and back (14 total miles) on the Bethesda Crescent Trail. It was really refreshing to ride in a different environment… I was like a kid in a candy shop looking at all the new things around me. 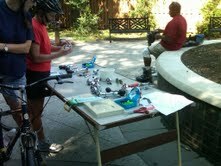 Another cool thing around this trail is that they not only have random water stations, but today, they were giving out FREE bike bells…so of course I got one. 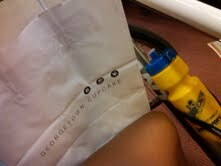 After our ride, Shima and I had lunch at Potbelly’s then we went to Georgetown Cupcake (don’t f*cking judge me!!!) and had a sweet treat (pic of me and my bike on the metro back home with my guilty pleasure of the day).